July is designated in the United States as National Sight Preservation Month. In this era of miraculous medical advances, it is tragic that despite decades of progress, loss of sight is increasing worldwide. There are an estimated 37 million blind people worldwide, the vast majority in Africa and Asia, of which 75% is considered preventable (the biggest culprits are cataracts and glaucoma). The U.S. has 1.3 million legally blind (20/200 or worse) individuals. For “normal” U.S. residents, with access to medical care and good water, in an age of global warming and drying, we offer the following simple and logical suggestions to help assure that you don’t go the way of the Africans or Chinese (The Chinese have by far the world’s worst air pollution and the highest incidence of dry eye disease and eye infection). BE PROACTIVE! It’s up to YOU to protect yourself and your loved ones. Carrying things like lip balm, sunscreen, bottled drinking water, sunglasses and a pocket eye misting device wherever you go is not too high a price to protect your health. Protect your eyes from ultraviolet (UV) rays. Wear hats and/or sunglasses in the sun. Drink plenty of water – eight to 12 glasses a day. Be well nourished – dark green leafy vegetables and omega-3 fatty acids are especially good for the eyes (spinach, leaf or romaine lettuce, chard, kale or mustard greens). Remove make-up and contact lenses at night. Don’t get make-up in your eyes and make sure your hands are clean when you touch your eyes. Keep a window opened at night, especially in the bathroom, to let in fresh air. Keep household air humid by placing bowls of water near heating and cooling vents, and by having plenty of house plants. Humidifiers also help. The easiest way to moisturize your eyes is by blinking. Normally, we blink 20 to 30 times a minute. However, when we’re preoccupied or deeply engrossed in a visual activity, the rate may drop to 2 or 3 times a minute. It is especially important when working at computers, to remind yourself to blink, and to take occasional breaks. Dry eye symptoms can be difficult to pin down. The most obvious are blurred vision and/or dry, irritated, burning, “grainy” and/or itching eyes. Symptoms can also be much less obvious, such as fatigue, headaches and sore shoulders. Or there may be no symptoms. Regular eye exams are very beneficial in tracking visual health. Pocket eye misting device. The easiest way to counteract dry, polluted outdoor air, or dehydrating indoor air, is to carry your own personal, portable, all-natural eye moisturizing device. 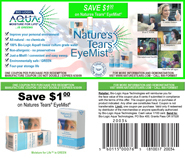 Nature’s Tears® EyeMist® from Bio-Logic Aqua Research is the ONLY product fitting that description. The product is applied in seconds, any time, anywhere, with no discomfort, head-tilting, eyelid lifting or blurred vision. No other eye care product adds pure, pH balanced moisture (micron-sized water droplets) to a dehydrated (water depleted) ocular tear film. Nature’s Tears EyeMist contains 100% Bio-Logic Aqua tissue culture grade water (trade secret) and is non-saline, non-allergenic, free from chemicals and preservatives, has a four-year shelf-life, and is environmentally safe and completely recyclable. Excellent for contact lenses and computer vision syndrome – 100 applications per one-ounce canister. Occupational health and safety. Industrial accidents constitute a significant vision threat in the U.S. While our industrial safety is the world’s best, safety eye wash stations are not nearly as widely available as they should be and most eye wash stations are built in a fixed position, cannot be shared and require you to flood your eyes for up to 15 minutes. In a burning or collapsing building, this could be life-threatening. The Bio-Med Wash® two-canister safety eye wash station, from Bio-Logic Aqua Research, is the only system that is all-natural, portable, sharable and quickly applied. The product contains 100% Bio-Logic Aqua tissue culture grade water and is non-saline, free from chemicals and preservatives, has a four-year shelf-life, and is environmentally safe and completely recyclable. Go green! Be part of the solution, not the problem. Paden, P, MD, The Sharon Kleyne Hour, www.worldtalkradio.com, 4-7-2007. Paden, P, MD, “Nature’s Tears EyeMist Versus Eye Drops,” animated DVD, Bio-Logic Aqua Research, 2003. Byrne, J, “Eye Mist Joins Growing List of Dry Eye Products,” Primary Care Optometry News, June, 2003.